1. Click File, Save As, and save the document again using the correct name. You'll now have a second copy of the document, but that's no big deal--you can always delete the first one later. 2. Close the document. 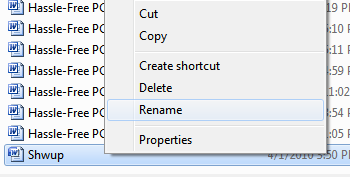 Then click File, Open, navigate to the incorrectly named file, right-click it, and choose Rename. Type in your new name, press Enter, and you're done. You can then open the file using its corrected name. The moral of the story: You can perform basic file-management operations inside the Open and even Save dialogs for many programs. Give it a try!